Teams of pick-pockets are operating in Dewsbury town centre. Shane Hussain had his bank cards and cash stolen last Thursday. Mr Hussain, a prevention worker with Kirklees Council, had just left the HSBC bank with his six-year-old son, Vinnie, at around 4.45pm, when he was distracted by one of the men. He said: “I turned my back on one of them, while obviously the other dipped into my pocket. “I didn’t realise until we were sat back in the car that my wallet had gone, along with all my bank cards, driving licence and £240 cash. “It’s frustrating because I am always careful. 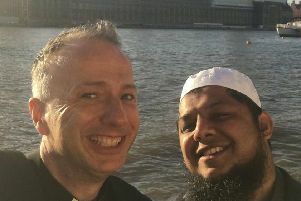 They are very clever in how they do it.” Mr Hussain said he was back in the town centre the following day and believes he saw the two same men hanging about outside Barclays Bank. He said: “I hung about a bit and watched them. One of them went into the bank and looked like he was writing something on bit of paper - all the time watching an elderly man drawing out cash, looking towards the other man outside. “I could tell he was keeping an eye on him, so I made it known I was watching them and as soon as he saw me they both walked off. Mr Hussain, 37, said he contacted the police, who are investigating and also made both HSBC and Barclays Bank aware of the situation. A spokesman from West Yorkshire Police said: “The Dewsbury and Mirfield Neighbourhood Policing Team are conducting enquiries into the incident. “It took place after the victim was approached by two white men just after leaving a bank. “One walked very closely towards the victim, causing him to change his path and as he did so, the other stole his wallet from his coat pocket. lKeep bags zipped and in sight at all times. lNot carry too much cash and always keep wallets and purses in secure places rather than in the hand. lAlso do not carry wallets, cash or mobile phones in back pockets where they can be easily spotted and stolen by opportunist thieves.